This weekend was my high school 30th class reunion. Four of my high school buddies and I went out boating Friday afternoon. 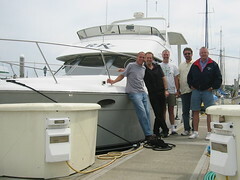 Morrie recently purchased a 36 ft. delux cabin cruiser which is moored at Blaine harbor. I told Morrie that his boat was missing an important piece of equipment - a sail! Of course the rest of day was spent enduring negative remarks every time we passed a sailboat. We cruised out to Sucia Island and back, a trip that would have taken me a couple of days in one of my sailboats! It was a great time of reacquainting ourselves and sharing memories. In the evening, our wives joined us for dinner.